Quick find answers for questions relate to our company, service, website and products. 1. How soon can I receive my order? After you checkout your order, a free personalized proof will be emailed for your approval within 24 hrs or on the following business day. Once we receive your artwork approval, we will ship out your order after 48 hours (2 business days) unless otherwise noted. The shipping transit time will be based on your shipping destination zip code and the shipping method you selected. 2. For the personalization, how many texts can I enter? Can I also have a logo/artwork? How do I know if my artwork/texts will fit? Our Free Standard personalization includes one logo/artwork and as many lines of text that can fit on the product. Our professional graphic designers will lay out your logo/artwork and text to be legible. If we encounter a problem with your artwork resolution and/or the length of your verbiage, we will contact you with our suggestions. 3. How do I personalize multiple items on my order? Simply add all items and qty to the shopping cart and proceed to the Personalization page step 2. On the Personalization page, each sku/ qty on your order has its own template form for different personalization. You can also specify the qty on one template, which has the same logo and texts, and then further specify the different recipient's name or award title. On the template, you can just enter all the texts for the first qty and click "+ Add another name (award title)" to enter each different name or title. 4. Can I view my personalization proof before checking out the order? Our procedure is to provide a professional proof after the order is placed to show the actual size of the product with the converted artwork and texts. Although our in-house graphic artists use their best design aesthetic to individually create the proof for each order, we allow up to 3 revision requests to our initial proof and require the proof approval before proceeding engraving or imprint production. Is it safe to order from CrystalPlus.com? Absolutely! CrystalPlus.com knows that you care how information about you is used and shared, and we appreciate your trust and want you to feel confident in our services and security as it relates to your personal information. We take the following types of security measures: use of technologies and policies such as limited access data-centers, firewall technology, and secure socket layer (SSL) certificate authentication. We designed CrystalPlus.com with safety and security. CrystalPlus.com accepts orders only from Web browsers that permit communication through Secure Socket Layer (SSL) technology. SSL is encryption technology that provides security while information is being transmitted over the internet. However, if you feel unsure, feel free to phone us toll free 1-888-779-8803 and you can order over the phone. Either way, you can shop with confidence at Crystalplus.com. 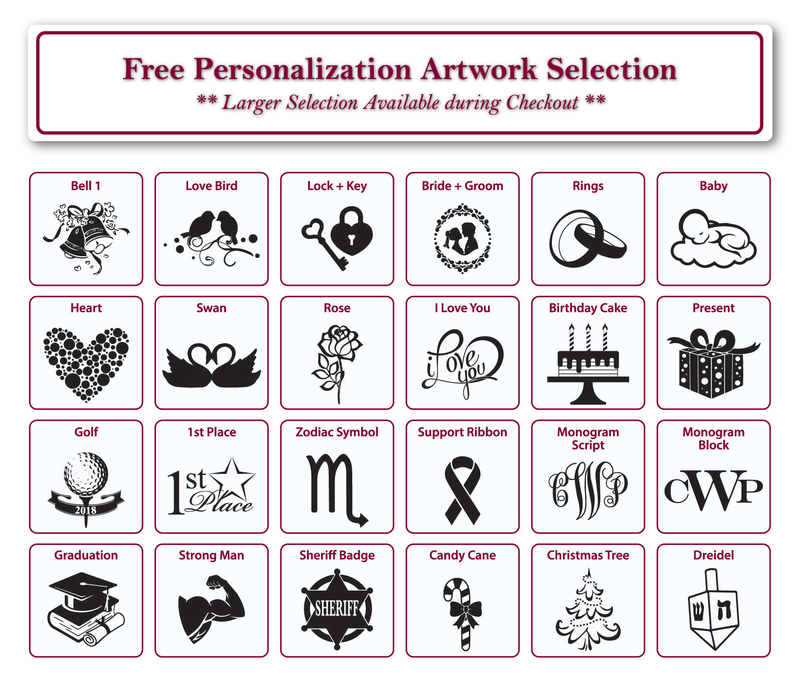 • Personalization Artwork & Engraving Standard Templates: Free and No Hidden Costs. • Product Selection: Wide variety of high-end crystal products designed for personalized awards and gifts including well-known European brands, Waterford, Vara Wang, Rogaska, Orrefors, Kosta Boda, Riedel, Nachtmann, Lenox, Kate Spade and more. All products are in stock for the fast turnaround. • FREE Artwork Proof with up to 3 REVISIONS for approval to begin production. We provide this free service for our customers to make changes to ensure that what they order is exactly what they’re going to get. • Production time: 24hr for Artwork proofs / 48hr for Engraving for professional standard templates. • Online Shopping: As easy as 1-2-3, Pick a product, Personalize it and Secure Check out. You can easily relate the generic crystal awards to your specific recognition need with our extensive online personalization templates. Our professional designer in house can also create the custom personalization artwork at very minimum charge to your total satisfaction. You can also easily estimate the shipping costs and delivery time before check out the order. • Services: A team of friendly customer services, artwork designers and experienced engravers are all in house to serve our customers every step of the way until the finalized version of the awards arrives at your door step. Even after you receive your order, we take care of any costs to replace damages or defects before your event. • Personalization Artwork & Engraving Templates: Charge a Set Up Fee, Rush Service Fee, Artwork Hours, Engraving Fee and etc..
• Services: Outsource and do not provide prompt and accurate services or designs. Claims for damages or defects take long time to process. How does your lowest price guarantee work? CrystalPlus.com is confident that not only do we have the highest quality of products, but we also have the lowest prices. Many companies have hidden fees; setup charges, engraving fees, artwork fees, rush service charges…etc., but not at CrystalPlus.com. At CrystalPlus.com, the price and shipping charge listed are your final cost. If you find any identical product with a lower price from other retailers, show us proof and we will offer you 10% off the competitor’s price. We will and can beat any competitor's price and service. Competitor's prices using "Coupon Code" are not eligible for price matching. Items from competitors that are not in stock or back ordered are not eligible for price match. We will beat any legitimate price if it is not below our cost. We do not match our discontinued models. We reserve the rights to determine if the competitor's item and service is identical to ours for price match. We may use the same product for our annual recognition event. Do you guarantee the same pricing and item availability? CrystalPlus.com cannot guarantee the inventory availability or the pricing until the order is processed. In the event of a pricing error or inventory shortage, CrystalPlus.com may refuse or cancel any orders placed for that item and will issue the full refund. We will notify you of any cancellations or suggestions of item substitution due to the fulfillment issue. Prices and availability are subject to change without notice. All coupons or specials that were applied to previous orders cannot be applied to the future orders in accordance with our promotion terms & conditions. Our main office is open 8am to 4:30pm PST to receive phone calls and live chat online. Some of our representatives make themselves available to clients during extended hours as well. Email is answered within 24 hours during business days, usually getting a response within a few hours. Which Award should I choose? Awards can be given by any person or institution, although the prestige of an award usually depends on the status of the awarder. We categorize our products by events or occasions, by design styles, by product shapes and by budget price range to narrow down the product selection among hundreds of available products at our website. There are also limits on how many characters can be engraved on an award. It depends on the size of the award. Please refer to the right side of the input field for the limitations of characters when you choose our free personalization. I don't like any product available at website. Can you make a custom award for me? Custom awards are our specialty. We can create and manufacture almost any design to fit your needs. The best way to get your project started is to submit an inquiry form to provide us detailed specifications as much as you could. We will contact you within 24 hrs. Design drawing to confirm specifications and price quotation will be provided for approval. Please anticipate at least 60 days lead time for custom product design, manufacturing and ocean freight from our oversea factories. Do all products come in a gift box? All of our products are paired with its matching gift box. Please go into the main product page to view the packaging details for that particular item. Please note that the gift box style is subject to change without notice. I am having trouble ordering online. What do I do? Occasionally, technology gets the best of us. If at any point you are experiencing difficulties browsing, ordering, processing payment or evaluating online, feel free to contact us either by phone (1-888-779-8803) or email (service@crystalplus.com). We'll be glad to help. How do I know my online order is received? An order confirmation will be emailed to you once your order is received by us. Within 24 hrs, we will also email you a personalizationed artwork proof with your uploaded logo and message for our standard template. The day your order is ready to be shipped, you will also receive a shipping confirmation by email, including UPS/ FedEx tracking numbers and links for up to the minute tracking! If an order confirmation email is not sent to you in the first place, please contact us 1-888-779-8803. We may not have received your order. I was unable to find an item on your web site, how can I find it? You can use our Search function to find the item. If you are unable to locate the item, it may be discontinued and no longer available for purchase. However, you can contact us and we will see if we can locate it for you. Beyond the extensive stock item selections at our website, we can also source from our local suppliers or custom make your own product designs. Click on "Login" at the top of any page. We provide a variety of ways for customers to reach us. Please contact us with any questions either by email: service@crystalplus.com, live chat, telephone toll free: 1-888-779-8803 or fax: 1-888-669-0838. We look forward to hearing from you. No. You can order one of any of our pieces. Minimums only apply to custom designs, but this is on a project by project basis. For more details, please contact us. 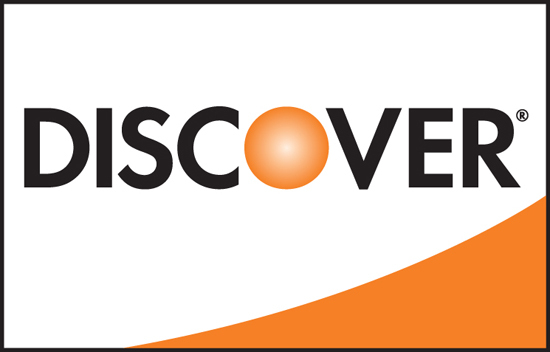 We accept most major credit cards including MasterCard, Visa, and American Express. When you submit your order on our secured website, your credit card will be authorized for the grand total amount. The authorized amount will be captured when we send out your first personalization artwork proof. We also accept PayPal payments for your convenience. If your company requires Check or ACH/Wire Transfer Direct Deposit as a form of payment, please email us your order information to service@crystalplus.com. We will then email you the Order Confirmation for the Grand Total amount due. The status of your order will be "Pending" until the payment is cleared in full with our bank. ACH/Wire Transfer payments are subject to a $10.00 bank charge. There will be a $25 service charge for NSF returned checks or credit card chargebacks. Do you accept a purchase order to defer payment? All orders must be placed with one of the following preferred payment methods: Credit Card or Paypal checkout. Prepayment is required before any further action is taken. If you are purchasing on behalf of a business or government agency that only issues a Company Check as a payment method, please contact us at 888-779-8803 or email your official Purchase Order to service@crystalplus.com. Our Customer Service team will place the order for you once we verify your organization's information. You will receive an Order Confirmation via email stating the Grand Total due for your check payment. Our art department will then provide you with an artwork proof based on your personalization information. Please note that although you approve your proofs, we cannot begin our engraving production until we receive your check in hands and it clears with our bank. Use Track Order for the current order processing status. Four steps are required to complete your order - Artwork proofs producing, Waiting for your proof approval, In production or Shipped. • Artwork proof producing: Within 24 hrs of an order received from our website, you will receive an email from art@crystalplus.com with a web link to review your personalization artwork proof for the logo, and message text you entered during checkout at our website. • Waiting for your proof approval: We offer 3 free revisions from our initial proof, and will accommodate any changes that can be fit on the product based on your selected personalization options to your total satisfaction. You are able to submit your changes or your proof approval from the web link provided on our personalization proof email. • In Production: After we receive your proof approval, we will start engraving/imprint production. Normal production time is 2-3 business days, unless order quantity is large or requires custom options. We will confirm the estimated package arrival date on the In Production confirmation email. • Shipped: Once your order ships, a confirmation email will be sent with a tracking number, which can also be linked to the carrier's website to track the delivery status. Most companies require a minimum of 5-7 days for engraving production, especially since sandblasting is a labor intensive process to achieve high quality. On the other hand, we at CrystalPlus.com provide fast turnaround service because we have products in stock and an experienced in-house production team. After artwork approval is received, our normal production time is 2-3 business days and ready for shipping unless otherwise noted. After a proof has been made and emailed to you, please respond back with an approval or revision as soon as possible so that we may begin our production. If we do not receive any response from you after one week, we will process your order into production and will directly ship it to you according to the initial proof we have created. We do not accept any returns or exchanges on engraved products. Before we send you an artwork proof, you may cancel or change your order without any charges or fees. After we send you an artwork proof, you may still cancel your order up until you submit your proof approval. However, a service charge, minimum $30 or 20% of the order subtotal amount up to $100 maximum, for artwork production and order processing will incur. We provide up to 3 revisions on the artwork proof for your approval to begin production. Before you approve your artwork proof, you are allowed to change your ordered item or quantity as one of the three proof revisions. Order change resulting in the order subtotal amount to become 20% less than the original order subtotal amount is subject to a proof & processing fee, 20% of the difference between the original subtotal and the new subtotal. Once the order is in production for personalization, the order cannot be cancelled or changed. Order cancellation must be received in written notice by email to service@crystalplus.com. Can I order bulk to use at a later date? Yes, we call this a Stock Reservation Program. One of the many benefits of this program is that your order can qualify for our volume discount. This program also ensures that there will be guaranteed stock for your monthly, quarterly or annual awards. Your inventory stock will be available for future engraving and shipment as needed. The total quantity order amount must be paid in full when the order is placed. The shipping cost for each future shipment will be charged accordingly. We guarantee that all products will be delivered safely to the requested destination. Most orders are packaged in damage resistant boxes and shipped with our primary carrier, FedEx or UPS. Years of packaging experience using sufficient and smart packing materials has allowed us to reduce possible breakage during transit. Are you affected by weather or holiday related delays? Unfortunately, anyone who ships by common carrier cannot control any weather or unexpected transportation issue that would cause the delivery delay. On the scheduled ship date, you will receive a Shipment Confirmation email with the package tracking information. You can track the delivery status on the shipping carrier's website to expect the delivery on the exact date. We only use reliable and guaranteed shipping services, i.e. UPS, FedEx, USPS to make sure your order will arrive on time. However, occasional delays may occur due to weather, unexpected transportation or uncontrolled incidents. CrystalPlus.com is not responsible for the shipment delay caused during transit. Refund request of the shipping charge will be processed upon the approval from the shipping carrier. What if my award arrives broken? We take the utmost care in packaging and shipping your pieces, however accidents may occur due to the fragile nature of our products. We must be able to file a claim with the carrier, so it is imperative that any damages are reported within 48 hours of receipt. A photograph of damaged products or boxes is required, and all packaging is retained for inspection. If you receive damaged awards and report the damage within 48 hours of receipt, we will take care of all costs required to replace your awards free of charge. Please also refer to our Return & Replacement Policy. How do I report a lost shipment? On the scheduled ship date, you will receive a Shipment Confirmation email with the package tracking information. You can track the delivery status on the shipping carrier's website to expect the delivery on the exact date. If you do not receive your package as scheduled, we must be notified within 48 hours of the estimated delivery date indicated on the carrier's tracking information. Once the shipment is verified lost in transit by the shipping carrier, we will ship the replacement at our sole expense within 2-3 business days using the same shipping method selected for the original order. No, we only ship to the U.S., PR, GU or Canada addresses. Our shipping charges are based upon the actual package weight or dimensional weight and service levels which include shipping method and shipping destination. Each service level gives a different price and guaranteed arrival date. Please keep in mind that we require 48 hours for engraving production after you approve our artwork to ship out your order from our California warehouse. Pick the best service level that gives you the needed guaranteed arrival date. For shipments to Canada, we include all custom duties, sales tax and brokerage fees in the shipping charge to provide trouble free at Canadian Custom and faster delivery. Can I use my own shipping account for shipping charge? No, we do not use any other shipping accounts to ship orders. We choose FedEx/ UPS as our sole shipping partner for their secure and reliable shipping services. Due to the fragile nature of glass and crystal products, it is also more convenient and easier for us to claim with our own shipping account, making it faster for us to ship replacements back to our customers at our own expense. Shipping times are provided by UPS/ FedEx, counted from the following day of the shipping date excluding Saturday, Sunday, and Holidays. Seldom delivery issues may occur due to exceptions or Mother Nature. We ship all orders from California, 91744. 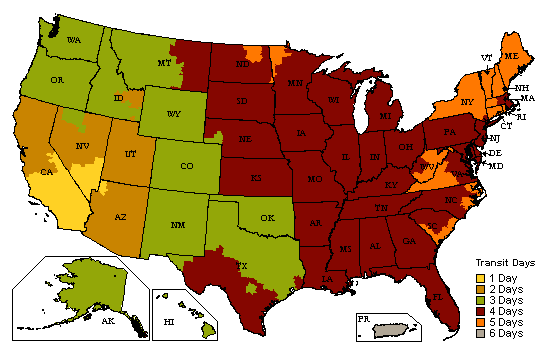 Depending on your zip code, U.S. Ground shipping time is 1-5 days; Canada 5-7 days. See the map below for transit days to your area. Express shipping is also available. Shipping costs for all available shipping options are provided on Shopping Cart. Can you drop ship awards to different locations for me? Yes, you will simply need to place an order for each shipping destination. The corresponding shipping charge will automatically be added for each order. For your convenience, you may simply email us your order details with all shipping addresses in an excel worksheet and we will place the order for you. We can also include any card inserts that you provide at no additional charge. What will the engraving/graphics look like? Our graphic artists will get the fonts and logos positioned in an esthetically pleasing manner according to our Standard Personalization Template illustrated on the product image, or in any way you have envisioned. We engrave on our high quality of crystal and glass products by Sandblasting methods for deep etching result. We do not recommend other engraving methods, such as Laser, which results in chips on the texts engraved on crystal or glass products. Our Wooden Wall Plaque Series are Laser engraved. This engraving method has shown better results on the Metal Plates that creates a shiny, polished finish on logos and text. We do not recommend any other engraving method, other than Laser, for this particular product. How much is engraving cost? Engraving is FREE for our standard template. One logo/artwork, texts, and personalization are included in our online price. No hidden fees! You can have your own logo/artwork engraved or choose from our pre-designed Free Artworks. You can also choose your preferred font type for the texts. What other Custom Personalization options do I have beside the Standard Template and how much is the additional charge? Custom artwork: If you require a custom designed graphic artwork from scratch, $30 one-time artwork fee will be applied. Additional logo/artwork: We offer One Free logo/artwork to be engraved on each piece. If you require additional logo/artwork, $30 one-time artwork fee for each additional artwork will be applied. You will not be charged again for your future repeating orders for the same logo. Additional engraving area: If you require additional area for engraving, which is not illustrated in our sample product image for standard artwork template, $6.00 per additional area per piece will be applied. Color Fill: If you require colors filled in the engraved logo/texts, $6.00 for logo and $6.00 for texts per piece will be applied. This option is only available for glass/crystal products. See Custom Personalization for all additional options and charges. For personalized products, artwork and engraving production require certain labor and material set up. At CrystalPlus.com, unlike other companies, set-up is included FREE of charge. When will I see an engraving artwork proof? Please allow 24 hours or 1 business day for us to send you a proof for standard template after the order is placed. Custom personalization artwork may require an additional 1 business day, depending on the instruction or graphic files you have provided. Can I view my personalization proof before checking out the order? Our procedure is to provide a professional proof after the order is placed to show the actual size of the product with the personalization artwork and texts. Although our in-house graphic artists use their best design aesthetic to individually create the proof for each order, we allow up to 3 revision requests to our initial proof and require the proof approval before proceeding engraving production. Engraving information is submitted online during the ordering process. After items are placed into your cart, click step 2 personalization, and upload your personalized logo and engraving text in our standard template. We illustrate our standard artwork templates, designed specifically for each product in its product detail page. Alternatively, you can choose "Custom" personalization and email us your logo artwork and text files to art@crystalplus.com with the subject line indicating the order number after you submit the order online. We strongly encourage you to choose our Standard Personalization method for faster order processing. How do I personalize multiple items on my order? Can I choose a specific font for my verbiage? Yes, please select from the font selection shown in the personalization template. If you do not see a font you like, you can specify the font name in the Additional Notes field. You may need to email the font file to our art department art@crystalplus.com if they do not have your desired font on file. If you do not specify a font, our art department will use the font as shown on our product image. The available colors are Gold, Silver, Black, White, Red (PMS200C), Blue (PMS7455C), Green (PMS356c) and Orange (PMS166c). Please note that depending on the complexity and proximity of the area you want colorfilled, only one color may be applied (i.e. no blending). For further information, please contact us at 888-779-8803 or email to service@crystalplus.com. How much is the colorfill option? The cost will depend on how much of the etching you would like to have colorfilled. If you would like to have either your Logo or Text, it will cost $6.00 per piece. If you would like both your Logo and Text, it will cost $12.00 per piece. You may choose different colors for Logo and Texts. What is UV Color Imprinting? Color imprinting is a personalization method achieved by transferring a film onto a crystal surface via UV lighting. Unlike Colorfill, which only allows a single color to be applied into the etching, this method creates a full-colored transparent effect. Available on selected Optical Crystal and Jade Glass products only. *Proper cleaning and care of Color Imprinted crystal: Maintain the quality and color by gently wiping the surface with water or non-alcoholic liquid cleaners. Refrain from using any abrasive scrubbers and keep away from sharp edges to prevent scratching. I won't know the winner's name for personalization until the ceremony or championship event. But I like to present the engraved award or trophy at the ceremony or event. What is my option? You may just type "Name" to reserve one line of texts in our Free Personalization template and submit your order. When we make an artwork proof, we will reserve proper space for the winner's name in blank. After the ceremony or event, you may ship back the engraved award or trophy to us at your own expense for engraving the name. There will be $10 charge per name plus shipping charge to ship again the final award. However, we are not responsible for any damage or lost during shipping back to us for engraving a name. We will notify you immediately should we receive your return damaged. Vector files are distinguishable as they will be in .eps or .ai format. When the logo is clicked on, numerous lines will appear within the logo. If a box opens up around your logo, the format is most likely not vector line art. Please refer to our artwork guideline page for more information. What if my award arrives engraved incorrectly? We take great care to ensure accuracy on all of our awards. Internal policies are in place to ensure we etch only and exactly what you approve, though mistakes may happen. If you receive awards etched differently than your approved artwork, we will take care of all costs required to replace your awards free of charge before your event. Should it be a customer error, we offer a courtesy discount to remake your awards. Expedited shipping is the responsibility of the client. We have large selections of crystal awards and business gifts made available with high-end, high perceived value raw materials. 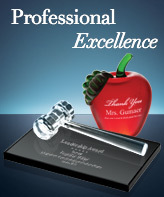 All of our crystal and glass recognition awards can be individually personalized with your logo, text and artwork. 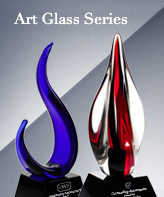 Rest assured, quality and value in our truly exquisite crystal awards are never compromised. The secret to our crystal award popularity lies in our high-quality deep etch sandblasting process. You can see and feel the richness and detail produced by the superb craftsmanship of our crystal engravers. Whether given as a premium or in recognition, the lasting beauties of our crystal creations are always appreciated. The creation of items in pate de verre through the "lost-wax" technique is a time-consuming process requiring abundant skills. The results of the successful application of these skills are true works of art, possessing a unique translucency, texture and substance, which can not be achieved with blown glass or molded glass. A contemporary revival of this French ancient technique is used to emphasize in bas-relief and incredible detail; that is combined with pure geometric optic crystal for a unique designer collection of thematic pieces designed for personalized awards and corporate gifts. We proudly include this designer line of 24% Lead Crystal Vase and Award Cups from Top European Designers to our collection. Each of our vases and bowls were created with large engraving areas to ensure plenty of space to add all your text and logos. Each piece is mouth-blown and deep hand-cut with the utmost care and passion for a noble and traditional art. This collection is treasured for its artistic value, which will continue to increase in time. A few bubbles and flaw lines are inherent to the nature of manufacturing. The 24% lead content enriches brightness, weight and hardness, while still ensuring clarity, sparkle and brilliance. Proposition 65 WARNING: Consuming foods or beverages that have been kept or served in leaded crystal products or handling products made of leaded crystal will expose you to lead- a chemical known to the State of California to cause birth defects or other reproductive harm. Our Clear Glass is a lead free, low iron product. Lower iron content results in a lighter green tint than compared to Jade Glass. Clear Glass mimics the high perceived value of Crystal but at a more cost-concious price point. The raw material for these glass sheets are only available in certain thickness, which complies with the highest quality standard. The beautiful polish and beveling on each piece creates a brilliant reflection that has a slight white fiery sparkle, giving it the name. Crystal is susceptible to minor surface scratches. Care should always be exercised in the handing of a beautiful piece of Crystal. Avoid products from contact with hard and sharp objects. Carefully manipulate crystal products making sure to avoid surface scratching. Rubber feet or dust free table cloth is highly recommended to be placed underneath of the crystal/ glass awards or gifts for display. Keep crystal products away from heat to prevent the UV bonded components if any taking apart. Spray a little window glass cleaner or industrial alcohol on the crystal and wipe it with a dust free cloth. Our selection of Premier Acrylic Awards is an economical choice and has many of the same characteristics as Glass and Crystal awards. Acrylic is shatter-resistant and provides a clean and professional frosted appearance. The advantage of Acrylic material is that it can be transformed into virtually any shape or color. The softness of the material allows the laser engraving technique to yield sharper and more vivid images than laser engraving on glass/crystal. The range of creative expression is virtually unlimited. *Due to the soft nature of the material, Acrylic items are more vulnerable to light scratches or flaw lines.